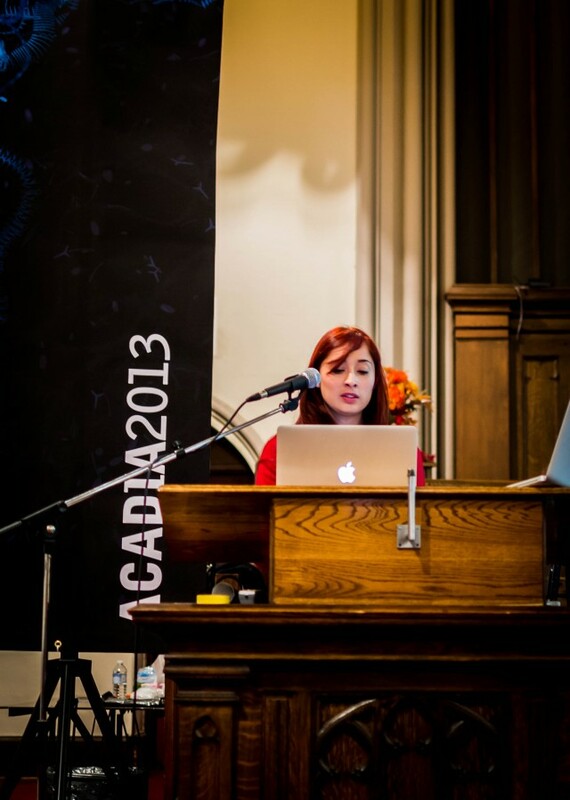 In November 2013 I had the oportunity to present mi work Synthetic Morphologies at the ACADIA conference. The ACADIA conference is the annual event where all the researchers and practitioners in the wider field of computation and architecture get together to share and discuss a topical aspect of the area. I have to say it was a highly rewarding experience (and a quite unusual one, ACADIA’s sessions were being held at a Presbyterian church near the Waterloo School of Architecture). After the main talk, I received a couple of comments from the audience. The first one, from the chair Bob Sheil, asked me to elaborate on the challenge it represented to reframe the notion of material to accommodate something which is microscopic. My main take on this is that this is in fact one of the most challenging aspects of working in synthetic biology in architecture. You have to device strategies that allows for the interconnection of scales. What we have partly been researching at ArchaID is precisely how we can create tools to understand the materiality of microscopic and mesoscopic scales. One of the other comments was more critical about the integration of elements between SynthMorph and proper lab work. I believe this is partly the nature of speculative research in design, and specially in synthetic biology. As I addressed at the session, there are numerous challenges in working with SynthBio, one of which is the fact that biology is still developing the frameworks to programme biological units. And I think these gaps can be partly addressed with a research through design approach, simply because in creating material possibilities within these interstices can help to understand the yet unknown mechanisms. I just want to wrap up this quick note saying that it was really helpful to have the feedback and ensuing conversations with different people at the conference. However, modifying and using biological organisms in design is still a quite new approach to the area. I can only assume this is due to the challenges brought by working with living organisms.